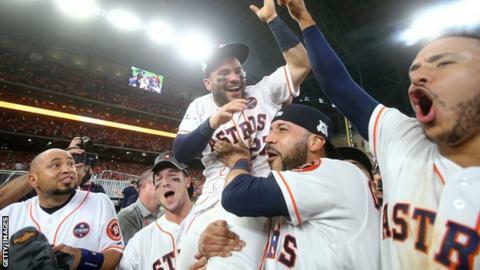 The Houston Astros will face the Los Angeles Dodgers in the World Series after they pipped the New York Yankees to the American League title with a 4-0 success on Saturday. The Astros had led the best-of-seven AL Championship Series (ALCS) 2-0, but the Yankees won the next three games in the Bronx to lead 3-2 before the series returned to Houston. Needing two home wins, Houston levelled the series on Friday before blanking the Yankees at Minute Maid Park on Saturday. Evan Gattis and Jose Altuve hit home runs before catcher Brian McCann's two-run double made sure there was no way back for the Yankees, who were chasing a 41st World Series appearance. Astros right-hander Charlie Morton took the win with five scoreless innings, backed up with four from Lance McCullers Jr in relief, while Yankees starter CC Sabathia left the game in the fourth inning after giving up a lead-off homer to Gattis. Pitcher Justin Verlander was named as the ALCS' most valuable player after leading the Astros to victories in Game 2 - where he pitched the complete game - and Game 6. The Dodgers had earlier clinched the National League title on Thursday, overcoming the Chicago Cubs 4-1. The best-of-seven World Series begins on Tuesday in Los Angeles - with the Dodgers holding home advantage by virtue of a better regular season record, 104 wins to the Astros' 101.